The EULAR recommendations suggest the use of methotrexate (MTX) with or without glucocorticoids (GCs) as adequate induction therapy for patients with newly diagnosed rheumatoid arthritis (RA).1 Furthermore, rheumatologists should strive for remission within 3 months in order to obtain better functional and radiological outcomes.1,–,3 However, some points of these recommendations should be discussed. Second, GCs are often used as bridging therapy for active disease in the period between induction of disease-modifying antirheumatic drug (DMARD) therapy and onset of their therapeutic effect.6 However, the extent and rapidity of clinical effectiveness may differ between the different GC bridging therapies. Finally, new ACR/EULAR criteria for RA7 have been published and rheumatologists will increasingly begin to use these criteria in their daily practice. The EULAR recommendations for treatment,1 however, were all based upon data from studies performed in patients fulfilling ACR 1987 classification criteria.8 Therefore rheumatologists need data to make a valid choice of induction DMARD therapy in the early phase of RA. For this study, data were used from a clinical trial (ISRCTN26791028) namely, Treatment in the Rotterdam Early Arthritis Cohort (tREACH).9 tREACH, a multicentre, stratified single-blinded trial, is performed in eight rheumatology centres in the southwestern part of the Netherlands. The medical ethics committee at each participating centre approved the study protocol, and all patients gave written informed consent before inclusion. An extended description of the tREACH trial has already been published.9 Inclusion criteria for the tREACH are: age ≥18 years, arthritis in one or more joint(s) and symptom duration <1 year. Patients were excluded if (1) they were diagnosed with a crystal arthropathy, (post)infectious arthritis, or autoimmune disorder other than RA; (2) were receiving DMARD therapy or corticosteroids; or (3) had contraindications for the initial study medication (chronic liver disease; excessive alcohol and drug use; pregnancy (wish); or laboratory abnormalities: leucopenia (<3.0×109/l), thrombocytopenia (<150×109/l), aspartate aminotransferase/alanine aminotransferase >2× upper normal value and creatinine level >150 μmol/l). Eligible patients were stratified into three groups according to their likelihood of progressing to persistent arthritis based on the prediction model of Visser.10 The three strata (low, intermediate and high) correspond to probability tertiles of developing persistent arthritis according to the Visser model. For this analysis, we included only the high-probability group since for the other strata recruitment is still continuing. Patients were randomised, using variable block randomisation stratified for centre, by an independent call-centre during working hours. Trained research nurses were blinded for the allocated treatment arm throughout the study. Research nurses examined the patients and calculated the Disease Activity Score (DAS), on which treatment decisions are based. Concurrent treatment with non-steroidal anti-inflammatory drugs and intra-articular GC injections (maximum two per 3 months) was allowed during the study. DMARD dosages were: MTX 25 mg/week orally (dosage reached after 3 weeks), SASP 2 g/day and HCQ 400 mg/day. GCs were either given intramuscularly (methylprednisolone 120 mg or triamcinolone 80 mg) or in an oral tapering scheme (weeks 1–4: 15 mg/day, weeks 5–6: 10 mg/day, weeks 7–8: 5 mg/day and weeks 9–10: 2.5 mg/day). All patients received folic acid (10 mg/week) during MTX prescription. Osteoporosis prophylaxis (risedronate 35 mg/week and calcium/vitamin D combination 500/400 mg/IU/day) was given to patients allocated to treatment arms B and C, during the first 3 months. For assessment of clinical efficacy the primary outcomes were (1) disease activity (state), and (2) functional ability. Disease activity was measured with the original DAS and its corresponding thresholds were used for the disease state categorisations.11 Functional ability was measured with the Dutch version of the Health Assessment Questionnaire (HAQ).12 Higher HAQ scores indicate poorer function. Secondary end points were EULAR response criteria13 and self-assessed disease activity, measured with the Rheumatoid Arthritis Disease Activity Index questionnaire (RADAI).14 EULAR response criteria are based on attained level and change in DAS. They classify patients as good, moderate or non-responder (see online supplementary figure S1). Higher RADAI scores correspond with more active disease. Sample-size calculation was based upon the area under the curve (AUC) of the HAQ, using data from the BeSt study,18 where mean AUC HAQ of combination therapy and monotherapy respectively was 7.7 (SD 5.5) and 10.5 (SD 7.4). A target sample size of 270 patients per probability stratum (90 patients per arm) was needed to detect the mentioned difference in AUC HAQ with a power of 80% and a two-sided α=0.05. This number of patients is sufficient to detect a difference of 6.1 AUC DAS (α=0.05; power 80%). Clinical efficacy was calculated in an intention-to-treat, using all available data, and per-protocol analysis. Statistical comparison between baseline characteristics and outcome measures of the treatment allocations were made by the Student t test, χ2 test, or the Wilcoxon rank-sum test, when appropriate. Multivariate analyses for the primary outcomes were performed, if imbalance in baseline characteristics between treatment groups existed. All analyses were performed for patients in the high-probability stratum and for two subgroups consisting of patients with RA according to 1987 and 2010 classification criteria.7 ,8 All statistical analyses were carried out using STATA version 11.1. A p value <0.05 was considered statistically significant. Up to now, a total of 693 patients have been assessed for eligibility and of those, 515 patients were included in the tREACH (figure 1). A total of 281 patients were included in the high-probability stratum and randomly assigned to (A) (n=91), (B) (n=93) or (C) (n=97). Four patients (1%) had protocol violations because of non-compliance (respectively one, two and one patient in arms A, B and C), but these patients were not lost to follow-up. All patients, who were assessed at 3 months, were included in our intention-to-treat (ITT) analysis (n=264). For the per-protocol analysis we excluded only the four non-compliant patients, because medication adjustments due to adverse events (AEs) are taken up in the medication protocol. Trial profile. Other reasons for dropping out were incorrect randomisation and problems with communication. GCs, glucocorticosteroids; HCQ, hydroxychloroquine; MTX, methotrexate; SASP, sulfasalazine. Table 1 shows the baseline characteristics for each treatment arm. The symptom duration, occurrence of erosions and proportion of patients who fulfilled the 1987 criteria for RA differed significantly between treatment arms (table 1). Therefore we also performed multivariate analyses for the primary outcomes. The DAS after 3 months, was 0.39 (95% CI 0.67 to 0.11) lower in patients with initial combination therapy than in those receiving MTX monotherapy. The difference in DAS between the different GC bridging therapies was 0.03 (95% CI −0.24 to 0.31) (table 2). About 78% of the patients, using combination therapy, had a DAS <2.4, compared with 60% of the patients using MTX monotherapy (table 2). Consequently, induction therapy failed for about 22% and 40% of the patients treated with respectively combination therapy and MTX monotherapy and therefore treatment was intensified to MTX with Etanercept (table 2). Baseline DAS was the only factor associated with active disease (DAS ≥2.4) after 3 months in all treatment arms. Odds ratios (95% CI) were respectively 2.27 (1.12 to 4.62), 4.36 (2.15 to 8.19) and 2.50 (1.47 to 4.26) in arms A, B and C.
Functional improvement was seen in all patients. The difference in functional ability between the treatment arms was not significant and only a trend could be seen (table 2). Secondary end points—namely, EULAR response criteria and RADAI, are shown in table 2. In the multivariate analyses we corrected for following factors: gender, rheumatoid factor, anti-citrullinated protein/peptide antibodies, presence of erosions, complaint duration and baseline DAS. A significant difference in disease activity (state) at 3 months persisted between MTX monotherapy versus combination therapy, but now also functional ability differed significantly between both groups (table 3). Again disease activity (state) and HAQ did not differ significantly between the GC bridging therapies (table 3). All mentioned analyses were based upon ITT. We also performed a per-protocol analysis for all primary and secondary outcomes, which showed similar results to those of the ITT analysis (data not shown). We also performed all the above-mentioned analysis for both subgroups—namely, RA according to the 1987 and 2010 classification criteria, which produced similar results (see online supplementary tables S1–S4). Table 4 shows the number (%) of patients with (serious) adverse events and treatment alterations due to adverse events for each treatment arm. The proportion of patients with medications adjustments differed significantly between the treatment arms. However no differences were seen in medication adjustments due to AEs, after stratification for drug. The reasons for lowering the MTX dosage were (1) gastrointestinal complaints n=6, n=2 and n=4; (2) raised liver enzymes n=1, n=2 and n=4; (3) distorted kidney function n=0, n=2 and n=1 and (4) bone marrow depression n=1, n=0 and n=0 in treatment arms A, B and C, respectively. MTX was switched to subcutaneous injections in 4 (5%), 14 (16%) and 5 (6%) patients in arms A, B and C, respectively. MTX was stopped in five patients (6%) in arm A, because of gastrointestinal complaints (n=4) and skin rash (n=1). In arm B MTX was stopped in six patients (7%) because of gastrointestinal complaints (n=5) and raised liver enzymes (n=1). Gastrointestinal complaints (n=2), elevated liver enzymes (n=1), bone marrow depression (n=1) and hair loss (n=1) were the reasons for stopping MTX in five patients in arm C.
SASP was stopped in nine (11%) and seven (8%) patients in arms A and B respectively. Reasons for stopping SASP were (1) gastrointestinal complaints n=7 and n=6 and (2) skin rashes n=2 and n=1 in arms A and B, respectively. The HCQ discontinuation rate was 2% in both arms (A+B). In both arms, the reasons for stopping HCQ were gastrointestinal complaints (n=1) and skin rashes (n=1). Gastrointestinal complaints and fatigue were the most commonly reported AEs (table 5). In this study, unbiased for GCs, induction therapy consisting of a combination of DMARDs is better than MTX monotherapy in early RA. The combination therapy groups more often achieved a DAS<2.4 within 3 months, which led to 50% less frequent treatment intensifications to biological agents compared with MTX monotherapy. A difference in functional ability was seen, which became significant after correction for baseline imbalances. Bridging therapy consisting of one single dose of intramuscular GCs is as effective as a 10-week intermediate dose of oral GCs. Although the proportion of patients with adjustments of their medication differed significantly between the treatment arms, no differences were seen in these adjustments due to AEs after stratification for the drug. This study was designed to start DMARD treatment in the early phase of RA. At the time of writing the protocol no internationally accepted criteria for classifying the early phase of RA were defined. Therefore, we based our design on the Visser model reflecting patients in an early phase of persisting arthritis.10 Interestingly, the Visser algorithm and 2010 criteria for RA have similar discriminative abilities to identify patients at risk of persistent arthritis at 1 year.19 Moreover, subgroup analyses in patients with RA according to the 2010 and/or 1987 classification criteria7 ,8 were performed and produced similar results. In this study, we analysed the effect of MTX monotherapy in comparison with combination DMARD therapy without making any concessions on GC bridging therapy. Our findings are in contrast to the present EULAR recommendations on RA1 and favour induction therapy with a combination of DMARDs rather than MTX monotherapy. Current recommendations are based upon a systematic review,5 which concluded that in DMARD-naïve patients the efficacy/toxicity ratio favours MTX monotherapy over combination therapy. However, in that review triple DMARD therapy versus MTX monotherapy in DMARD-naïve patients was not compared. Furthermore, trials favouring triple DMARD therapy (BeSt, FIN-RACo and COBRA trial) were excluded from that review,18 ,20 ,21 because a MTX monotherapy control arm (without GCs) was missing. A recent systemic review by Graudal and Jürgens,22 supports the results found in our study. The second strength of our study is the higher proportion of patients reaching lower disease activity states than in previous trials. A DAS<2.4 was reached in 80% of our patients compared with 60% in the BeSt trial.18 Remission (DAS<1.6) rates were respectively 40% in tREACH versus 20% in BeSt. This difference is probably due to (1) the choice of induction therapy and (2) a lower baseline DAS. Important differences in initial combination therapy between our trial and the BeSt were higher MTX dosage (respectively 25 mg/week vs 7.5 mg/week), and addition of hydroxychloroquine. Our baseline DAS was lower than in the BeSt trial (3.4 vs 4.5), but this is probably correlated with the phase of the disease. This study underlines the perspective of treating patients in an earlier phase of RA, for which the 2010 ACR/EULAR classification criteria are developed. Furthermore, induction combination therapy contributes to achieving the desired remission within 3 months, which is recommended by the current recommendations, in order to obtain better functional and radiological outcomes.1,–,3 A tailor-made approach to treatment might be preferable in this very early phase of RA, because 60% of the patients respond well to MTX monotherapy. However, clinical applicable predictors of early treatment response are still missing. Our study had certain limitations. First, despite randomization, an important difference in prognostic factors was present at baseline. However, these imbalances were in favour of MTX monotherapy. Moreover, correcting for these imbalances by multivariate analyses led to a significant difference in functional ability at 3 months (favouring combination therapy). Second, in our study only the research nurses, who performed the disease activity assessments on which treatment decisions are based, were blinded. This design was chosen, because we wanted to conduct a trial which closely represents the daily practice of rheumatologists. Single blinding, however, might be a potential source of bias—namely, an information bias. Third, MTX was in some cases given subcutaneously because of gastrointestinal complaints. The distribution of parenteral MTX is imbalanced over the treatment arms. 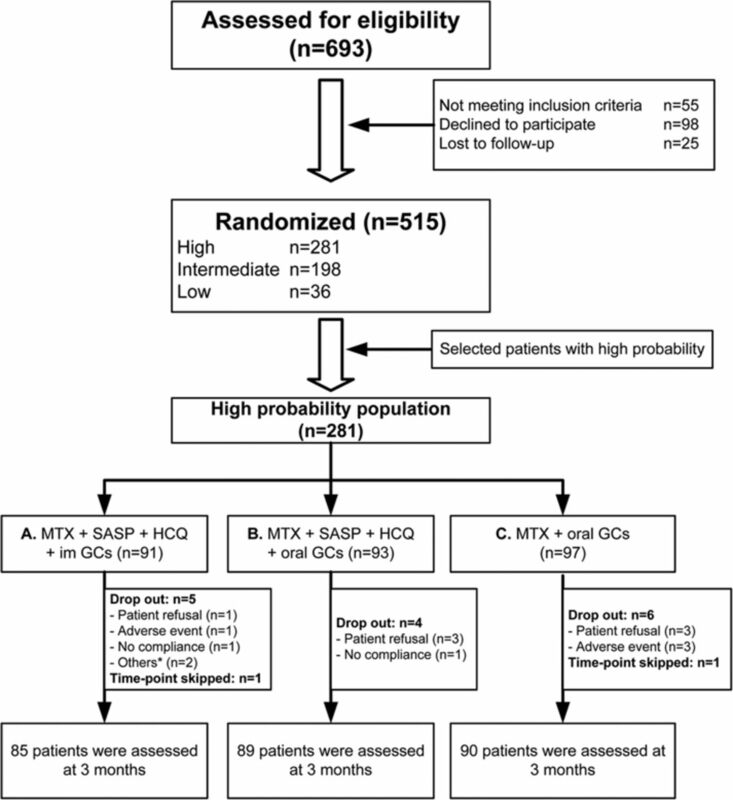 The bioavailability of parenteral MTX is higher than with MTX given orally, which is associated with an increased efficacy.24 However, similar results were found if the patients with parenteral MTX were omitted. Several studies have demonstrated that the choice of induction therapy influences the initial clinical response and indirectly the amount of joint destruction and treatment changes needed to achieve low disease activity, with costs possibly increasing over many years.18 ,20 ,21 The current RA treatment recommendation, however, is cost-effective when a strategic approach with rapid treatment intensification to biological agents is used when the response is inadequate.25 In tREACH 20% of patients need biological agents after 3 months, compared with 40% in the BeSt study, which suggests a 50% reduction in biological usage.18 However, we included patients in an earlier phase of RA, representing a larger population than the BeSt study, which might lead to higher costs. On the other hand, if patients are in sustained remission, medication can be tapered swiftly.26 The results of the long-term follow-up of the tREACH trial, including analyses of joint destruction and cost-effectiveness, should clarify the afore-mentioned issues for patients with early RA. In conclusion, we recommend induction therapy consisting of a combination of DMARDs (MTX+SASP+HCQ) as first choice in patients with newly diagnosed RA, because combination therapy reduced disease activity more rapidly after 3 months than MTX monotherapy. Consequently, 50% fewer biological agents were prescribed in the combination therapy groups. Although the proportion of patients with medication adjustments differed significantly between the treatment arms, no differences were seen in medication adjustments due to AEs, after stratification for the drug. One single intramuscular GC injection or an oral GC tapering scheme can be used because they are equally effective as bridging therapy. The authors thank all patients who are enrolled in the tREACH trial. Without their active cooperation, our trial would not be possible. The tREACH trial comprises the following rheumatology centres: ErasmusMC, Rotterdam; Sint Franciscus Gasthuis, Rotterdam; Maasstad Ziekenhuis, Rotterdam; Vlietland Ziekenhuis, Schiedam; Admiraal de Ruyter Ziekenhuis, Goes and Vlissingen; Zorgsaam Ziekenhuis, Terneuzen; Albert Schweitzer Ziekenhuis, Dordrecht. The authors thank the following people from all centres, in alphabetical order, for their contribution in the tREACH trial: Aartsen R, Alfenaar C, Alves C, Arendse R, Arnoldus M, Baak-Dijkstra M, Bal-overzier J, Basoski N, Beer S, Berkel D, Bonte F, Born van den M, Breukelen van D, Bron S, Buijs H, Buijs N, Cambier M, Claessen S, Colin E, Dekker A, Dolhain R, Donze M, Fodili F, Haasnoot H, Hamelink B, Han K, Houdt van Y, Hove van L, Jager de J, Jasperse J, Jonkers C, Joziasse S, Klootwijk K, Krommenhoek T, Krugten van M, Lam Tse W, Leemput van H, Legierse C, Maclean P, Man de Y, Matena D, Molenaar A, Mous L, Nijs J, Paassen van H, Quax R, Reijnierse J, Romme A, Rotte de M, Schaeybroeck B, Schardijn G, Schrauwen S, Sturm L, Sutter T, Tchetverikov I, Tusschenbroek D, Veldman R, Voordt van der A, Voorneveld H, Vroed de M, Walravens M, Walter M, Werff van de N, Westeinde van het A, Wiele J, Willemse M, Wouter J, Zandbergen W, Zwart H.
. Current view of glucocorticoid co-therapy with DMARDs in rheumatoid arthritis. Nat Rev Rheumatol 2010;6:693–702.
. Use of risk stratification to target therapies in patients with recent onset arthritis; design of a prospective randomized multicenter controlled trial. BMC Musculoskelet Disord 2009;10:71.
. How to diagnose rheumatoid arthritis early: a prediction model for persistent (erosive) arthritis. Arthritis Rheum 2002;46:357–65.
. A self-administered rheumatoid arthritis disease activity index (RADAI) for epidemiologic research. Psychometric properties and correlation with parameters of disease activity. Arthritis Rheum 1995;38:795–8. Nederlandse Vereniging van Reumatologie. NVR Richtlijnen medicijnen: Methotrexaat, 2009:1–4. Nederlandse Vereniging van Reumatologie. NVR Richtlijnen medicijnen: Sulfasalazine, 2002:1–6.
. Adverse drug reactions: definitions, diagnosis, and management. Lancet 2000;356:1255–9.
. Diagnostic performance of the ACR/EULAR 2010 criteria for rheumatoid arthritis and two diagnostic algorithms in an early arthritis clinic (REACH). Ann Rheum Dis 2011;70:1645–7.
. Current evidence for the management of rheumatoid arthritis with glucocorticoids: a systematic literature review informing the EULAR recommendations for the management of rheumatoid arthritis. Ann Rheum Dis 2010;69:1010–4.
. Comparison of the clinical efficacy and safety of subcutaneous versus oral administration of methotrexate in patients with active rheumatoid arthritis: results of a six-month, multicenter, randomized, double-blind, controlled, phase IV trial. Arthritis Rheum 2008;58:73–81.